Arnold Schwarzenegger & Bruce Willis To Reprise Roles In "The Expendables 2"
There have been no shortage of crazy casting news stories for The Expendables 2 recently, with such names as Chuck Norris, Jean-Claude Van Damme, Taylor Lautner, and Donnie Yen being mentioned for various roles. Today, though, we are happy to announce that the trifecta of badass is complete as Arnold Schwarzenegger and Bruce Willis are confirmed to join Sylvester Stallone for bigger roles in the action-adventure sequel. In The Expendables last year, both actors only appeared in vague cameos, and now are believed to have a more "substantial" part to play in the Simon West-directed second take. The plot finds the mercenary group seeking revenge after Tool (played by Mickey Rourke), the heart and soul of The Expendables, is brutally murdered on a mission. Joining the fracas is Tool&apos;s beautiful young and reckless daughter Fiona (still yet to be cast), who embarks on her own revenge mission, and is captured by a ruthless dictator plotting to destroy a resistance movement. Sounds almost like the first flick, doesn&apos;t it? You can thank Sly Stallone for that, as he wrote the sequel&apos;s script, and doesn&apos;t seem to want to tread any harsher waters. Actor Bruce Willis will attempt to sandwich the high-octane flick between G.I. Joe 2: Retaliation, which is currently shooting, and Die Hard 5, which begins production early next year. 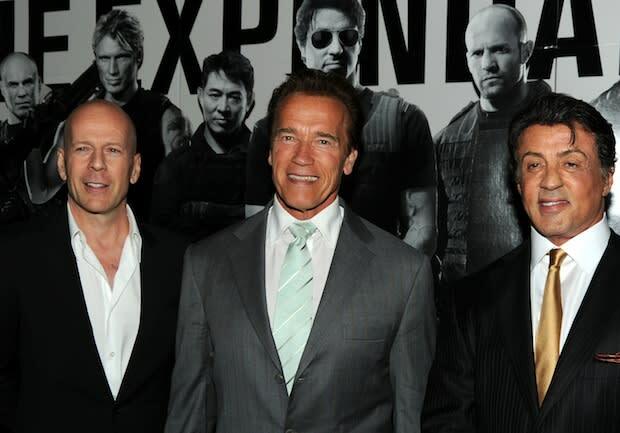 The Expendables 2 will start rolling cameras in October and will hit theaters on August 17, 2012.
Who else do you see joining this macho-fest of a movie? Name your Expendables crew in the comments section below.